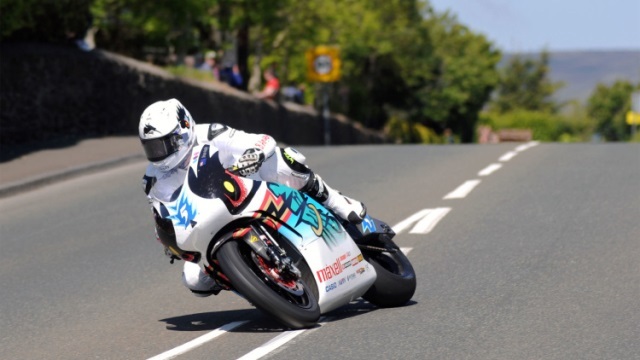 For the second consecutive year Team Mugen, with the latest iteration of the Shinden electric motorcycle, Shinden Yon, set new benchmarks in the Isle of Man TT Zero class. Arriving at the same time as a Force 9 gale hit the island disrupting the practice week schedule and forcing the cancellation of the planned Saturday practice for TT Zero, which along with a mechanical failure in the Friday free-practice for the #5 machine of Bruce Anstey, meant Team Mugen had only 1 lap of current data available to them at this stage instead of the planned 4 laps (equivalent to 4 x race distance) and the team were forced to amend their strategy for the remainder of the event. By the end of practice week the rain and high winds had abated and after tireless work by the organisers and their teams, the race week schedule was back on track. Although there was to be a re-arranged practice session for the TT Zero on the Tuesday, which Team Mugen elected to sit out in order to avoid any potential compromise of their race strategy, the team had just one more practice session in which to finalise the race settings for Shinden Yon. On a dry bright Monday evening the 2 machines took to the famous TT Mountain Course running faultlessly for the arduous 37.73 mile journey. At the end of the session John McGuinness, riding the #1 machine, had set a new unofficial lap record of 118.056 mph, beating his own 2014 race record, with team-mate Anstey 2nd quickest in the session with a 116 mph lap. TT Zero series debutants, Victory Parker Racing, with Guy Martin substituting for the injured William Dunlop, and Lee Johnston also showed impressive form with both machines lapping over 100 mph. Come race day however the Team Mugen Shindens remained on current form the ones to beat. 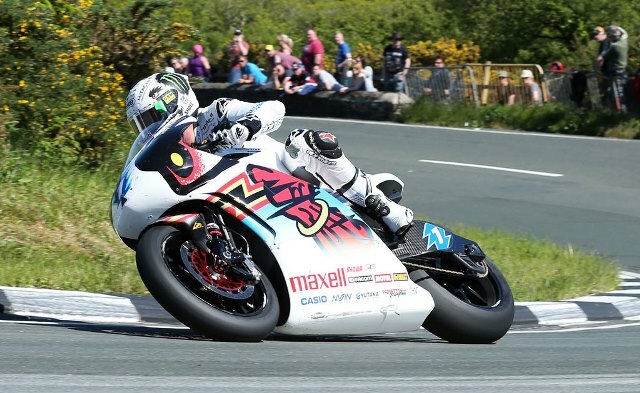 In perfect weather conditions McGuinness was first away in the time-trial format race, with Anstey 3rd in line behind Victory Parker Racing’s Johnston. Acceleration from a standing start to over 37 mph at the first timing beam 30.9 metres away is now on a par with many of the petrol-driven 1000cc Superstock and Superbikes, and after speeding down Bray Hill and through the Braddan Bridge section, Anstey was soon past Johnston in pursuit of MGuinness. At the first check-point both Shindens had comfortably established 1st & 2nd positions in the race, with Anstey marginally in front of McGuinness. Topping 162 mph at the Sulby Straight timing beacon McGuinness had gained the lead by Ballaugh, which he was to hold until the end. Crossing the finish line at 144 mph John McGuinness claimed his 2nd TT Zero win for Team Mugen, his 22nd TT victory overall, and set a new lap record for TT Zero of 119.279 mph, posting the first (and to date, only) sub-19 minute lap for EV bikes. Bruce Anstey finished just over 4 seconds behind in runner-up position, to complete the second 1-2 in consecutive years for Team Mugen. Victory Parker Racing’s, Johnston, completed the podium with a highly creditable 111 mph lap, followed in 4th by his team-mate, Guy Martin with a lap just under 110 mph. With 2nd-year competitor, Sarolea, markedly improving on their debut year, posting a 106+ mph lap and coming in 5th place this was the first time in TT Zero history that 5 machines had beaten the 100 mph barrier in the same session, and the average lap speed of all finishers for the race was over 106.5 mph. When Team Mugen first entered TT Zero in 2012 an electric motorbike had yet to produce a 100 mph lap, and in just 4 visits the Team’s year on year improvements has also seen the 110 mph milestone surpassed and are now tantalisingly close to breaking the 120 mph barrier – which is amazing progress for battery/electric motor technology in 3 years. 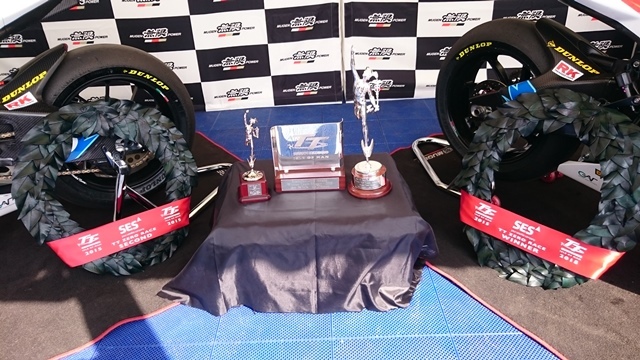 Footnote: apart from their success with Team Mugen and Shinden Yon both team riders had a win apiece elsewhere during TT 2015. Bruce Anstey took the opening race of the meeting on his Honda Fireblade Superbike, run by Padgetts Racing. This was Anstey’s 10th TT win, but his first on board a Superbike. John McGuinness backed up his mid-week TT Zero victory with an excellent win in the Blue Riband event of the meeting, the Senior TT, aboard his Honda Fireblade prepared and run by Honda Racing. This was McGuinness’ 23rd TT win overall, and his 7th Senior TT, equalling the Senior TT record of the great Mike Hailwood.